A perfect blossom is a rare thing. You could spend your life looking for one. And it would not be a wasted life. During spring, cherry blossom (sakura) viewing parties (hanami) and cherry blossom festivals are held all over Japan. Cherry blossom viewing has been a Japanese custom since the 7th century when the aristocrats enjoyed looking at the cherry blossoms and wrote poems. People drink, eat, and sing during the day and night. It is like a picnic. From late March to early April, sakura go into full bloom all over Japan. The blossom forecast (“sakurazensen” or “cherry blossom front”) is announced each year by the weather bureau, and is watched carefully by those planning hanami as the blossoms only last a week. Just what I was looking for to cheer me up. Usually,on a day like today,i blog surf to find something to rebuild some enthusiasm. And luckily with just one click I got in here and found a beautiful piece. The Last Samurai, one of my fav movies, how truely said! Your picture reminds me of one lonely tree, early in the spring, last year, amongst a concrete jungle of high rises of chicago, perfectly blossomed with somewhat similar flowers, just white in color. Quills: Yes, that is the idea behind the cherry blossom viewing parties—welcoming the spring. It is celebrated very enthusiastically all over Japan. maya cassis: Thank you maya. I just loved the lines when I saw the movie. I wanted to use it somewhere. So the picture and the verses…. venus: I felt that Tom Cruise deserved an Oscar for his performance in the movie and the movie also deserved one. One of my favorite movies too. Yes, you can find the cherry trees in full bloom in your part of the world and they mostly will be White. 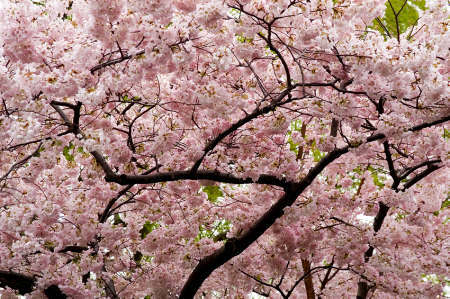 The Pink colored cherry flowers are mostly seen in Japan. Spring is such a wonderful time. Its a time of rejuvenation not only for nature but for us too. excellent pic and insights. i am so amazed by the eastern culture. @ geo – lol..you are such a fun guy! I loved the movie, especially the performances of Tom Cruise and Ken Watannabe. But I don’t think he deserved an oscar for the movie. But ofcourse the cinematography, costumes etc were deserving. I think Ken should have won the supporting actor award. It gives hope and happiness. I always wanted to take one of this kind. But I always missed it. and congrats on the Amazon Shorts … u have 6 novels listed there ? how did u go about it ? Wow, that is a great picture! Interesting information too – I did not know about sakura and hanami. Mind Curry: the only cherry blossom i had in mind was the one me and Charlie use on our shoes. ROFL. James Bright: I too loved that picture. I was taken by some Japanese photographer. I bought it from a photographic web site. Deepa: Thank you Deepa. The 6 books listed are not novels. They are computer science books. Two of them are published from Boston and they will automatically get listed at Amazon as they are published in US. Others are published in India and some distributor has got them listed at Amazon. What is the confusion about Tom Hank’s Oscar..? Let me know, if you don’t mind..! Cherry blossoms…they look so delicate, frothy and lovely. Is that a Haiku? Silverine: Yes, I think it is a Haiku. I asked a friend who was in Japan for many years and has learned the language. He says it is. Besides it meets most of the criteria—3 lines, short, the first two lines preparing the reader for the last one, and so on. Good pic. Is that celebration something similar to our Vishu? If I am not mistaken, its Tom Cruise not Tom Hanks in ‘The Last Samurai’. God, that was a beautiful picture. Sometimes, nature just makes you pause…it can stir some many intense emotions with you -you feel joy, you feel sad, you feel happy, you feel warm, you shiver…but you are always in awe. I came into your blog through Maya/Quills, and it is a pleasure to get to know you. Look forward to getting to know you a little better! i remember my eyes growing damp as the samurai murmurs – ‘perfect..’ as he takes his last breath. Oh ! like that …. read maya’s comment.. thats y we do it..
reminds me of our “kanikonna” and vishu 🙂 ..
a thing of beauty is joy forever..great pic..
Woww beautiful! I had my post too about sakura last few days ago on my blog and still have the hang-over of hanami ^_~ (yup we have sakura here in the nearby park).i live in Tokyo . Kathy: Weclome Kathy. I visited your blog and got a lot of information about Sakura and Hanami.